Your Currency Converter is a free Windows 8 currency converter app available under the ‘Finance’ section of Windows 8 App Store. Here, in this currency converter Windows 8 app you can easily convert all major currencies, instantly. Also, you can look for all the latest currency exchange rates, only in this currency converter app. 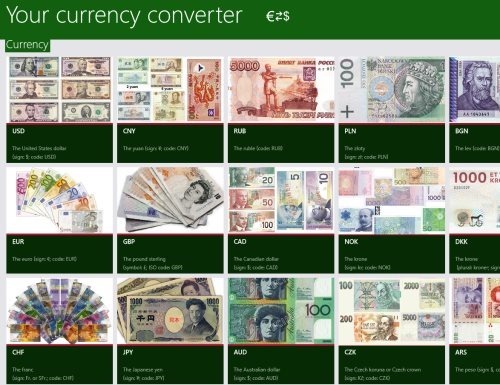 The attractive thing about this currency converter app for Windows 8 is that it shows the pictures of the currencies along with basic info about it including country’s currency. As you click on one you will find a picture with a short description below along with currency of the countries. You need to click on a currency to which you want to convert the selected country’s currency. Just input the value and click on ‘Exchange’ button. You will get the answers instantly. In addition, you will also find the updated exchange value and the date & time on which the rate was last updated. You can also pin some selected currencies as separate tiles on the Start Screen. This allows you to track the changes that happen in the exchange rates, throughout the day. You will find almost all the important countries, images of currency notes, a bit of description, value per currency, date & time of lastly updated exchange value. Let me quickly point out the main features of this Windows 8 currency converter app. Also, check out our post on Unit Converter App, and Zip File Apps. Lets you view foreign exchange rates of almost all the important countries. Lets you convert currencies of different countries, instantly. Lets you track the changes that happen in the exchange rates, throughout the day. Brings you images of currency notes along with a bit description and date on which it was lastly updated. Lets you share currency exchange rates with others. It’s a free currency converter for Windows 8. Well.. 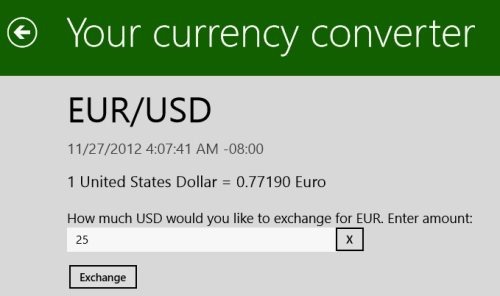 I really liked this Windows 8 currency converter app. You can view exchange rates, convert currencies, pin currencies as tile, track changes in exchange rates, share currencies with others, and learn many things related to currencies. It’s a must-have app, you will surely love it. Open the given link in Windows 8’s IE10 and click on ‘View in Windows Store. Proceed with further installation steps and get it right away. In short, Your Currency Converter is a good utility Windows 8 currency converter app to view exchange rates and to convert currencies, instantly. Go ahead and download Your currency Converter now. Its free..!